Last week a Wisconsin judge set May 8th, 2012, for Wisconsin’s recall election, which will decide whether to remove Republican Governor Scott Walker, along with the State’s GOP Lt. Governor and four GOP state senators, from office. That recall election, less than 8 weeks away, is viewed by many as a bellwether on the power of public unions to resist the efforts of government to rein in out-of-control collective bargaining contract obligations and expectations. 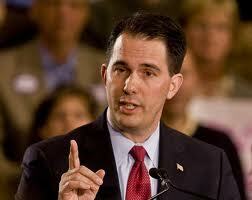 Walker was elected as the Republican Governor of Wisconsin on November 3, 2010 -- less than two years ago. He won the gubernatorial race handily, beating his Democrat opponent Tom Barnett by roughly 54% to 45%. That was the same election in which Republican businessman Ron Johnson defeated Russ Feingold, an 18-year incumbent Democrat US Senator, by approximately 53% to 46%. Limits public unions to negotiating only on wages, not on benefits. The powerful teachers’ union WEAC- Wisconsin Education Association Council- collected about $23 million in union dues each year from its almost 100,000 members before the new bill, and paid their employees an average of $95,000 a year—higher than the average teachers’ salary. WEAC spent $500,000 over the summer of 2011 supporting Democrat candidates in related recall elections. But it is an even bigger deal than that. Wisconsin has historically been a reliably Democrat state. President Obama won Wisconsin in 2008, and it has not gone for a Republican for 24 years. Yet two years ago, voters there elected Republican Governor Walker, and removed an eighteen-year Democrat incumbent from the U.S. Senate. Russ Feingold’s defeat was seen as a signal that even Democrats were alarmed by President Obama’s big government, far-Left agenda, and were willing to remove a favorite son from public life. If the voters flip back and support this Democrat/union-sponsored recall effort, it could be seen as a gradual acceptance of Obama-era left wing policies. A recall victory could also be seen as tolerance and even acceptance of the growing and unholy alliance between the Democrats and public unions. The Wisconsin battle is blatantly about unfettered public union rights vs. the people’s right to bring unionized employees’ wage and benefit packages more in line with private sector standards, and with budgetary realities. Public sector union membership in America is five times higher than in the private sector. The Bureau of Labor Standards reports that in 2011, only 11.8% percent, or around 14.8 million wage and salary workers in America were members of a union. A whopping 37% of public sector workers are members of unions, as opposed to only 6.9% of private sector workers. Fred Siegel, of the Manhattan Institute, a conservative research organization, said that the burgeoning ranks of the public unions has “enormous political ramifications,” and that “public unions are a rising political force” in the Democrat Party. And why wouldn’t they be? Even a cursory review of the Top All-Time Donors to the political parties and candidates between 1989 and 2012, shows that of the top 20 biggest donors, fourteen gave all or nearly all of their donations to Democrats, and among those fourteen, 3 were public unions, and nine were private sector unions. One last point about public unions and the Democrat Party. Did you ever stop to visualize the loops your tax dollars follow? Your tax dollars are used to pay public employees, such as the teachers and firefighters, over 1/3 of whom are unionized. Who (the Democrats) then vote to support and embolden and further empower public unions to demand more and more. Of course, all public employees, unionized or not, are paid by our tax dollars. And God bless all of them who teach our children, protect our communities, fight fires and perform the thousands of jobs that keep our communities safe, clean and running efficiently. There is no quarrel with the idea that America needs good public sector employees, and needs to pay them fairly. The quarrel is with the money-circulating, arm-twisting public unions whose power is too fierce, too unbending, and too intertwined with the Democrat Party. Back to Governor Scott Walker. His accomplishments since becoming Governor are many, including signing a balanced budget in June 2011 for the 2011-2013 time frame that did not raise taxes. The Federal Reserve just announced a bright economic forecast for Wisconsin, the best since 2003. America is facing so many turning points, and this is surely one of them. Support Scott Walker in whatever way you can. This race is about so much more than Wisconsin.